Native hedging may seem like an obvious choice, as native species have proven to be able to deal with the climate and soil conditions in our part of the world. However, many of the most popular hedging plants in the UK are not native species. For example, many hedging conifers, such as the Leyland cypress, the thuja and the dawn redwood, are all non-native. In fact, even though privet is considered a British garden classic, it is also not a native plant. Box, on the other hand, appears to be native to the UK, although there is some debate on the subject. As many gardeners prefer evergreen hedges, they often end up choosing a non-native hedge plant. Yew and holly, however, are both native evergreen hedging plants. While most formal hedges are evergreen, most country hedges are composed of native, deciduous plants. Characteristic country hedging plants such as hawthorn, sloe and dog rose are all native to Europe and the UK. Despite the fact that so many high-quality hedging plants are non-native, choosing native hedging has many benefits. For one, you will be guaranteed that your hedge is perfectly suited to the British climate. Secondly, you can be sure that local wildlife will be familiar with your choice of hedging plant, which in turn means that they can profit from its flowers and berries. Native hedging plants are helpful to many endangered species of insects and birds. Not only because they are an important source of food, but also because they often offer the best nesting places. 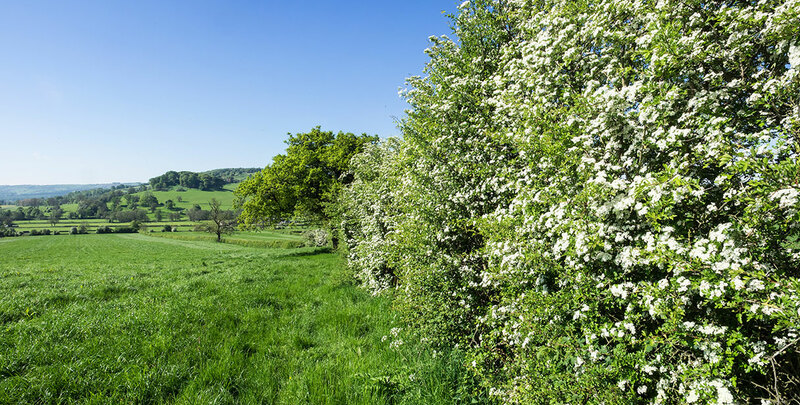 Traditional country hedgerows have been very helpful to birds and pollinating insects, but they have gone into decline in recent years. They are well-worth preserving, however, as they are not only of immense value to wildlife; they are also an iconic part of the British countryside. Mixed country hedges generally consist of native species that make a great natural border around farmlands and are a good choice if you are looking to keep uninvited guests out. In fact, if you are looking for a hedge that will perturb unwanted visitors, but also produce beautiful flowers, look no further than dog rose and hawthorn. 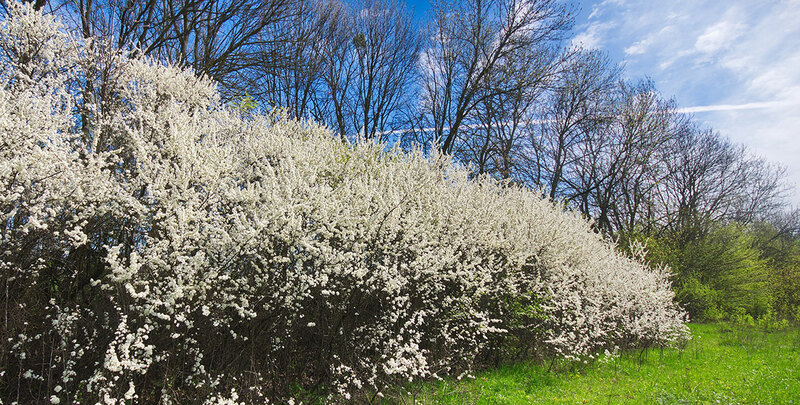 Sloe, also known as blackthorn, is also an option, although its sprawling growth habit makes it suitable only to large gardens. Some varieties of dogwood are also native to the UK and will make excellent wildlife hedges. Should you desire an evergreen screening hedge, however, box, yew and holly are all suitable native hedging plants that will provide you with a dense hedge that will guarantee year-round privacy. In addition, box is often used for topiary purposes, as it is not only easy to cut into a certain shape, their slow growth habit will also ensure that a topiary specimen of this species will remain in shape for a long time. While box can have issues with a disease known as box blight, the common yew, which is also known as the English yew, and the common holly are both very resilient plants. 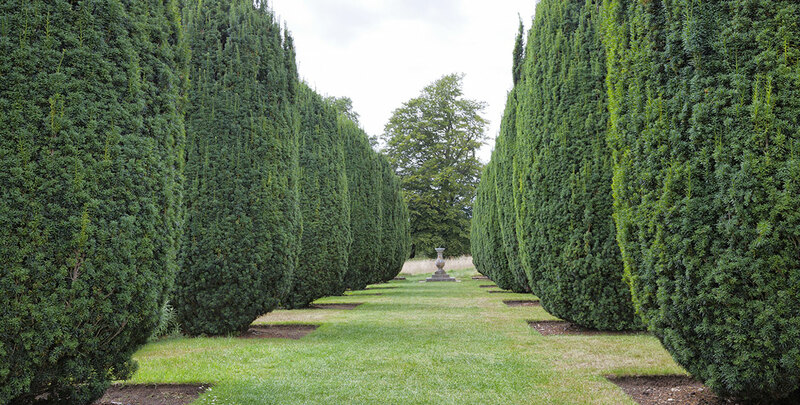 Both yew and holly require little maintenance, as they are quite slow growing. In fact, these two hedging plants have quite a few things in common. For example, both species are composed of male and female plants. This means that you will need to plant at least one male specimen in your hedge to ensure berrying, as yew and holly will both produce pretty red berries in the autumn. These will give your hedge some winter colour and also provide food for birds. 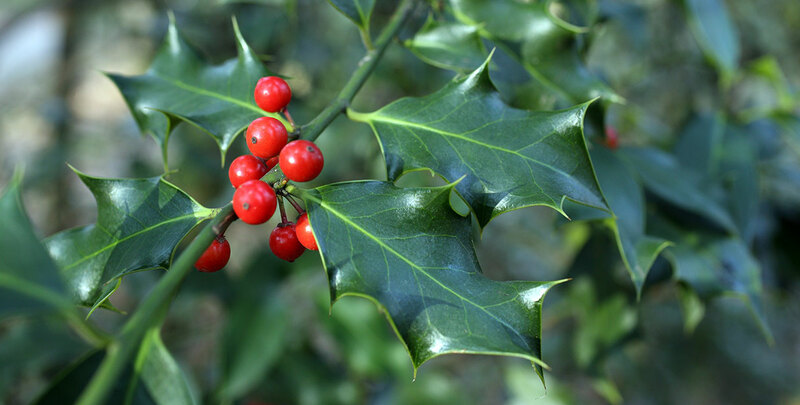 Holly has the additional advantage of having prickly leaves, as it also creates an excellent security hedge that way. As you can see, growing a native hedge has many benefits and does not mean you have to compromise. However, the fact that a hedging plant is native to the UK does not necessarily mean that it will do well on any soil in the UK. All species suitable for native hedges still have their specific soil and maintenance requirements. Generally, native evergreens need to be pruned more frequently than deciduous hedging plants. However, even deciduous native species can be kept relatively formal in appearance if pruned regularly. If you have decided to plant a native hedge, keep in mind that you do not necessarily have to pick a single species hedge. It is also possible to combine different species and create a beautiful mixed native hedge. Please refer to the pages of the specific native species for more in-depth information on the planting and maintenance requirements of these hedging plants. Contrary to what some people might think, choosing a hedging plant that is native to the UK is not settling for less. In fact, there is a wide range of various evergreen and deciduous native hedging plants available for different purposes. Holly and yew are excellent hedging plants if you are looking for year-round screening, hawthorn, sloe and dog rose are the species to go for if you are looking to create a rustic, classic British country hedge and box has been the top choice for topiary enthusiasts worldwide for a long time. There is simply nothing that native hedging plants cannot offer. If you want to make sure that a hedging plant will do well in your garden, choosing native species is a safe, wise choice, as their history and continued survival has proven that they will be able to deal with the weather and planting conditions in our part of the world. There is a wide range of native hedging plants available, so the perfect native hedging plant for your garden definitely exists.